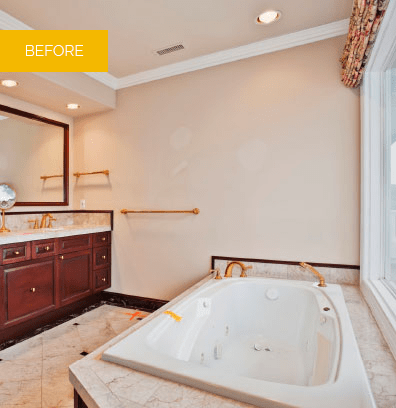 For their California ranch home with Pacific Ocean views and a style reminiscent of the Hamptons, these homeowners wanted a master bathroom that would embody the home’s original character while attaining a new level of classic luxury. Amazing views were amplified with careful space planning. 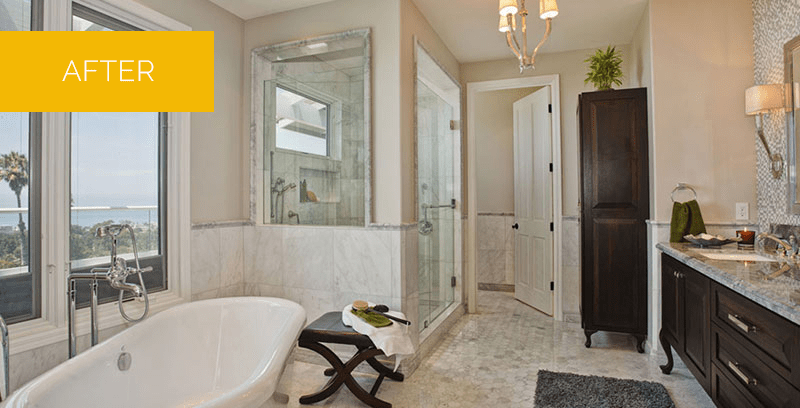 The bathroom was designed with plentiful open space and defined areas for comfortable sharing. The built-in free standing tub makes a statement as an art piece and architectural element. Old world romance is expressed with rich materials including granite and marble in varying sizes and shades, a glittering glass and marble mosaic and dark cherry woods. Marble wainscoting and an intricately detailed marble baseboard encompass the room with elegant definition. Glamorous mirrors framed with a darker shade of mirror gleam above a cherry vanity custom designed to look like substantial furniture in a room that combines Old World dressing room with modern master bath.